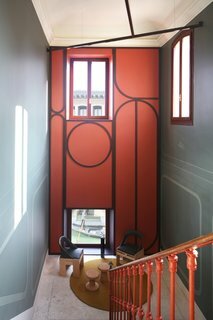 A renovation breathes new life into an apartment and its access stairwell in a historic Venetian building. Facing a small canal in sestiere San Marco, Another Venice is the latest project by Andrea Marcante and Adelaide Testa of the Italian architectural firm Marcante-Testa. Inspired by its location—where an extraordinary architectural past struggles to absorb contemporary developments—the interior architecture cannot help but reflect the magical city's rich history. 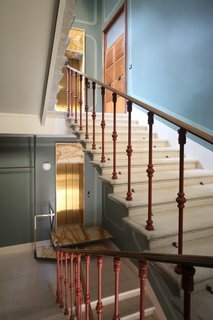 Set in a traditional 19th-century building, the firm's renovation involved both the communal areas of the building (the entrance hall and access stairway), as well as a residential interior. 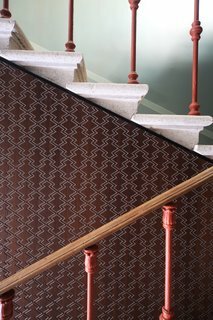 Taking into consideration the relationship between the interiors and exteriors, the design process began with a graphic and modern reinterpretation of the building's exterior facade—seen in the paneling that lines the access staircase. 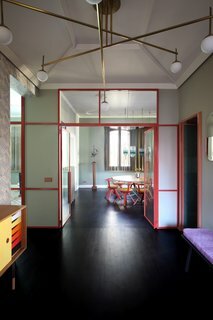 The "inhabited" landing foreshadows the intimacy of the apartment. The incredible selection of European furniture and lighting starts even before you enter the residence. 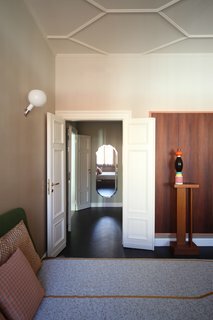 The access landing is home to Carlo Scarpa's 618 Chairs for Meritalia, a Calicut carpet by Ruckstuhl, a Cork Family coffee table by Jasper Morrison for Vitra, and an ashtray by Enzo Mari for Danese Milano. The staircase features milled-eucalyptus wood and was designed by Marcante-Testa and built by Materia Design. 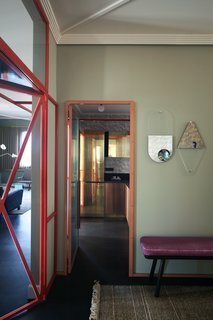 The apartment unfolds through a series of painted metal-and-brass dividers inspired by Carlo Scarpa's renovation of Ca’ Foscari. The dividers incorporate elements of green glass and wooden panels that have been treated with Venetian stucco, partitioning the spaces while preserving the natural lighting in areas that don't have windows. 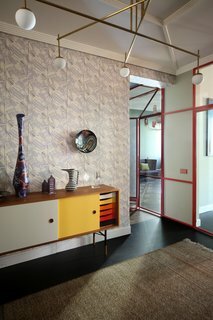 The apartment's entrance is lined with "Vanessa" wallpaper by Mini Moderns. 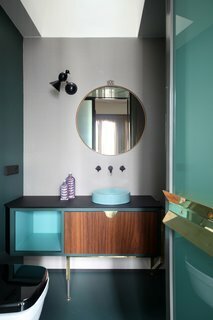 The space features a Finn Juhl sideboard in teak, a chandelier in brass and glass by Commute Design, an Obei Obei mirror by Atipico, and vintage 1950s ceramics from Arts & Crafts Gallery in Venice. 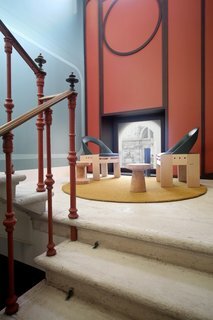 There's also a Bench One by Another Country that's been covered in Pillar fabric by Kvadrat. 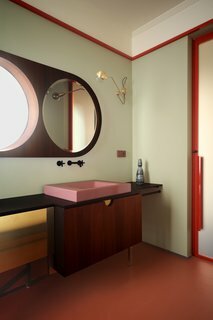 From the glass of the lamps and the color of the walls to the shaded effect of the wallpaper and iridescent carpeting, the project incorporates a strong sense of place—reflecting the Venetian lagoon, its landscape, and its distinctive color palette. 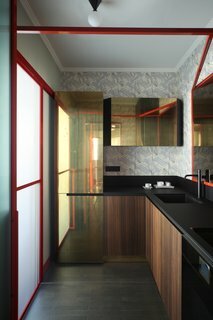 In the kitchen, the doors are made out of brass and eucalyptus wood while the lighting is from Atelier Areti. The countertops are made with high-thickness laminate Polaris by Abet Laminati and were designed by Marcante-Testa and built by Materia Design and Om Project. The faucets are from Bellosta. 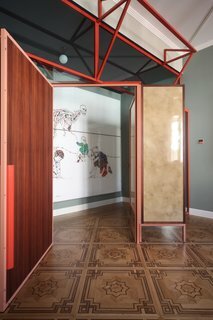 An initial partition creates a relationship between the entrance and living room, preserving the original design of the parquet flooring with inlaid "squares." 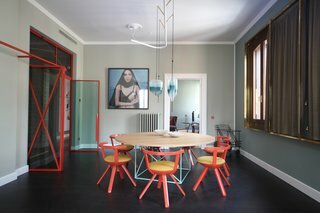 The eclectic dining room houses a LC15 table by Le Corbusier for Cassina, Rival Chairs by Konstantin Grcic for Artek with Kvadrat fabric, a bar cart by Rossana Orlandi, and Flow pendant lights by Wonder Glass. The windows are covered with curtain fabric from Black Edition, along with brass frames by Marcante-Testa that were built by Om Project. 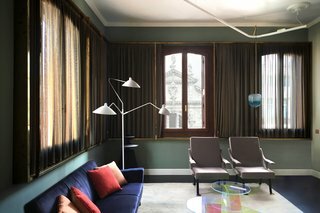 A system of brass frames with gilded, metal-screen curtains reinforce the relationship between the windows and the Venetian landscape, creating an almost continuous ribbon of windows throughout the space. 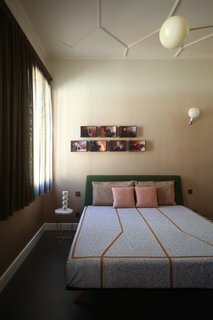 The living area includes a Lars sofa by Bonaldo, a Leaf chandelier by MM Lampadari, a Frate dining table/desk by Enzo Mari for Driade, and a table lamp by Ettore Sottsass for Vistosi. 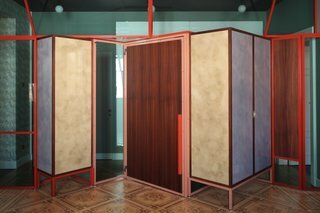 A metal-and-glass partition is set on the original wooden parquet and fitted with doors and cabinets, all designed by Marcante-Testa and built by Materia Design and Om Project. 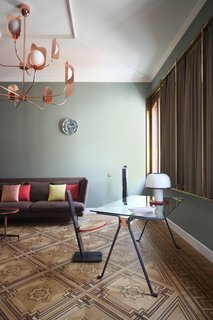 This living space is finished with a Lake Carpet by Raw Edges for Golran, Digamma armchairs by Ignazio Gardella for Santa & Cole, Shimmer coffee tables by Patricia Urquiola for Glas Italia, and an iconic floor lamp from Serge Mouille. The hues of the Murano glass in the living area evoke the city's reflections in its canals at twilight. 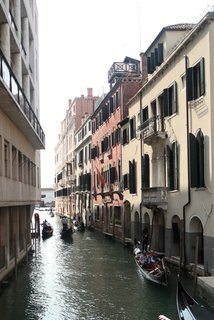 In fact, almost every detail seeks to reinterpret and incorporate the Venetian landscape into the design. The master bedroom is complete with a Hepburn bed by Matthew Hilton for De La Espada with Kvadrat fabric upholstery, bedcovers made with Rubelli "terrazzo" fabric, an Oliver Tray Side Table by Evie Group, Modo pendant lighting by Roll & Hill, Parola wall lamps by FontanaArte, and a table lamp by Parachilna. 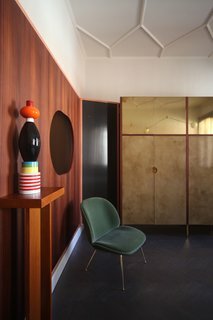 This corner of the space features a Beetle dining chair by Gubi, a totem by Ettore Sottsass from Arts & Crafts Gallery in Venice, mirrors by Atipico. The incredible boisery consists of eucalyptus wood, glass, brass, lacquered iron, and "stucco veneziano" by Marcante-Testa, built by Materia Design and Om Project. 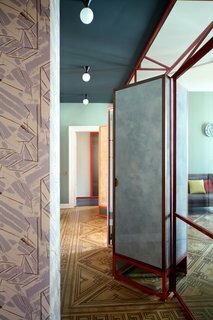 The Saraille wallpaper is by Designers Guild while the ceiling frames were designed by Marcante-Testa and built by Orseolo Restauri. 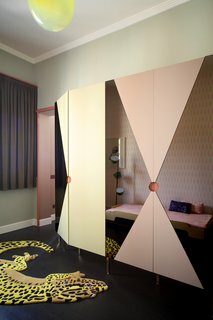 This funky bedroom features a Salamandrian carpet by JIWONXKIM, a blow-suspended lamp by &Tradition, a Tam Tam floor lamp by Marset, and a wardrobe made of lacquered-MDF and pink mirrors. 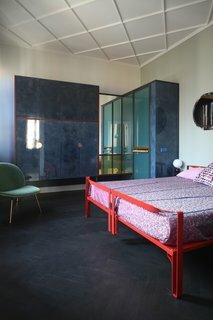 It partially hides a stacking bed by Muller Mobelweskstatten.